What kind of guild environment do you like? From this I am referring to whether you like a quiet guild or a chatty guild – is there a happy medium? I have noticed that the guild I have joined never says anything in guild chat and you really have to push them to chat? My perfect guild is chatty, runs older content together, farms achievements, does guild battleground groups, and runs current raiding content in an efficient manner. 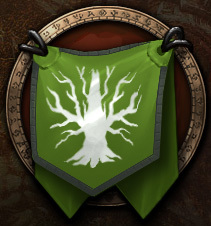 My perfect guild is the guild I am already a member of–Shade of the Elm. When the Elephant and I started the guild, we’d had quite a bit of experience of what we didn’t want in a guild, so we aimed to fulfill all of the goals of what we wanted in a guild with the help of some real life friends, and some good friends we’ve made in WoW. While the guild has its quiet moments depending how many members are online and what they are participating in, generally the guild chat is going. Sometimes about WoW topics, and other times about other games, and sometimes poking a little bit of fun at each other. It’s the chatty environment I’ve always wanted, and that I had had in other guilds I have fond memories of. I’ve always enjoyed running older content. Mainly for posterity, and because I love the environments, especially in the BC era. My perfect guild runs old content on a regular basis. I like running old content for items and gear, to spend time joking around and having fun with my guildies and to grab some achievements. Speaking of achievements and old content, I love guilds that do this together. Whether it be runs for a Bloodbathed Frostbrood Vanquisher or an Ironbound Proto-Drake, or even just to kill the Whale Shark, I love getting achievements with guildies. I love running “Fun Nights” with guildies that also want specific achievements. Now, while the general population of WoWers doesn’t lust after having Over Ninethousand achievement points, a lot of people do want specific achievements. And I love helping them get those achievements. Including the PvP achievements they’re interested in. Though I haven’t run many lately, I love battlegrounds. And I love running battlegrounds with my fellow guildmates. I just love the atmosphere of smashing Gnomes together in all of the neat environments Blizzard has implemented for Player on Player combat. It’s a favorite pasttime of mine, much like raiding. Now don’t get me wrong, raiding older content is really fun, but raiding the new content is even more fun. My server is kind of dead (at least Horde side) now that some of the top raiding guilds have transferred elsewhere. My guild is currently clumped with a lot of other guild sitting at 6/7 in Firelands. Thanks to some very talented individuals we’ve made it really far this expansion. While we’ll never be world-first or even server-first, we’re proud of the progress we’ve made. Both raiding groups have come a long way from the start of the Cataclysm expansion, and we plan on moving at our own pace. It sounds like you found the perfect guild, which is quite an amazing feat in WoW 🙂 I love the people in my guild, but certain things about the guild and how things are done frustrate me at times – as well as people sometimes slacking off with attendance. I'd never leave though since I've played with these people for many years now, and in the end that matters more to me. Yup, also envious!! It does sound like the perfect guild! Sadly I am an achievement chaser, but I have noone to do that with….My guildies HATE doing any content that is not current (and even if it is current and on farm status they don't want to go there anymore). You're guild sounds so lovely…..Thank you for posting about this shared topic!